shovels lime into tank and opens valve admitting water; controls, by hand, lever of mechanical stirrer and continues adding water and stirring till milk of lime is of required consistency; opens valve regulating supply of chlorine gas under pressure; after test by chemist, runs off contents of tank to next process in manufacture of potassium chlorate. attends at vats to neutralisation, crystallisation and drying of sodium acetate; opens valve to run acetic acid into lixiviating vat; shovels caustic soda to vat till acid is neutralised; starts mechanical stirrer by hand lever, and admits steam to jacket of vat by means of valve to cause solution to crystallise; runs off mother liquor for reuse and shovels crystals out of vat into barrows. general term for a process worker q.v. employed on acid making plant. treats free fatty acids and other by-products of margarine refinery, by heating with steam and by adding sulphuric acid, to produce acid oils (raw material for soap making). in acid manufacture, general term for persons engaged in manufacture of acids; includes acetic acid maker (142), carbolic acid refiner (142), acid burner, chamber man, column man, concentrating acid man, de-arsenicator, hydrochloric acid maker, kerslerman [sic, probably error for kesslerman], acid mixer, nitric acid maker, oleum man, oxalic acid maker, acid purifier, sulphuric acid man, towerman; in explosive manufacture , general term for persons making, blending, or denitrating nitric and sulphuric acids in explosive factory; includes concentrating acid man (142), de-nitrator (142), hand mixer, nitrator, nitro-glycerine maker, picric acid worker; in celluloid manufacture; cf. acid worker (148). a process worker q.v. engaged in making alizarine dyes from dye-base anthracene. a process worker q.v. making alizarine, a base from which alizarine dyes are made. shovels soda ash (sodium carbonate) into tank, and stirs it up with water; shovels in lime and stirs and heats mixture by opening valve admitting steam at bottom of tank; when action is complete allows liquor to settle and runs or pumps off caustic soda solution formed to boilerman (518) q.v. a process worker q.v. who makes alum cake by mixing, by mechanical mixer, measured quantities of hot powdered calcined clay, or other aluminous material, and sulphuric acid in lead-lined vessels and allowing product to solidify; weighs out powdered clay and tips it into vessel; then runs in known volume of acid, and operates lever which set� stirring apparatus in motion. see muriate of ammonia maker. a process worker making dyes from dye-base aniline; runs aniline or a derivative into vessel, and runs in other chemical, stirs mixture by hand or mechanically, controls temperature by means of valve letting in steam, hot or cold water to coil in vessel; allows products to separate and runs off product required; may also distil off product if necessary; cf. distiller (142). a process worker q.v. in charge of plant in which that part of coal tar distillate, called anthracene oil, is allowed to stand and cool, till impure anthracene separates out; runs off liquid part of distillate; dries anthracene by shovelling into a hydro-extractor, and passes it to powerful hydraulic press in which more of adherent oil is squeezed out; feeds cakes of pressed anthracene to grinding machine and stirs up powder formed in closed vessels with solvent naphtha to extract more impurities; runs oft' naphtha and impurities, leaving anthracene ready for next operation; cf. anthracene man (149). general term covering workers in manufacture of artificial silk, e.g. acetate of sodium maker, spinner, neutraliser; cf. artificial silk worker (398). see soda recovery man. .
controls, by means of valves, passage of hydrogen and chlorine gases to brick chamber in which the hydrogen burns at series of jets to form hydrochloric acid gas; controls flow of water down tower against uprising stream of hydrochloric acid gas, regulating flow of water in tower by valve, to ensure that all gas is absorbed. attends lead-lined vessels into which he runs light oils (benzols) distilled from coal tar, and strong sulphuric acid and regulates mechanical stirring apparatus; agitates mixed liquids for some minutes, then leaves them to separate and draws off acid layer, washes residual benzol in similar way with dilute caustic soda, and runs off washings, leaving benzol purer and ready for further distillation. see chlorate of potash maker. a process worker q.v. in charge of part or whole of plant in which bicarbonate of soda is made by ammonia-soda process; may be an ammonia stillman (142) q.v. or control apparatus in which he saturates strong brine with ammonia gas by passing ammonia from still through a valve to bottom of vessel containing brine cooled by cold water coil; also controls flow of lime kiln gases, containing carbon dioxide, by means of valve to carbonating tower into which he pumps brine solution saturated with ammonia; runs out from bottom of tower, sludge containing bicarbonate of soda crystals, for recrystallisation. converts a mixture of salt cake (acid sodium sulphate) broken limestone and small coal into black ash by heating it in a furnace; shovels or tips mixture on to bed of furnace, or into hopper of revolving furnace, which he subsequently sets revolving by moving a lever; controls, by moving dampers, passage of furnace gases heating mixture, and in case of fixed furnace, rakes over mixture at intervals to ensure completion of action; when mixture is at fusing point, works black ash so formed up into balls which he rakes and shovels from furnace into iron barrows to' solidify. assists black ash maker q.v. in furnacing salt cake mixture and preparation of black ash. general term covering any worker engaged in bleaching cotton for use in explosives; may be placing cotton in tanks, running in bleaching solution and agitating by mechanical stirrers; drying cotton in hydro-extractors and drying stoves; making up dried and bleached cotton into bales, by hand, for despatch to explosives factory. wheels barrows of slaked and ground lime into elevated leaden chambers; spreads lime raked into furrows over floor of chamber; controls, by means of a valve, flow of chlorine gas into and temperature of chamber by diluting chlorine with air should temperature tend to rise too high; rakes lime over by hand to expose fresh surface to assist absorption of chlorine, and blows out excess of chlorine at end of operation ready for bleach packer (149) q.v. mixes and blends different grades of cellulose acetate, in manufacture of artificial silk, by running them into mixing tank and stirring by hand or mechanically. attends mixing plant into which he runs different kinds of oil; blends them by stirring and heats them in pans to complete blending process. a process worker q.v. who runs sulphuric acid into lead-lined vessel into which he has previously tipped or shovelled roasted copper ores, stirs contents by hand, and may also heat by means of a steam coil controlled by a valve to assist solution of copper ore by acid; runs out copper sulphate solution formed into vats, in which copper sulphate crystallises out, i.e. , blue stone; cf. crystalliser. attends kier or vat in which he boils raw cotton in caustic solution, preparatory to its being made into guncotton. a process worker q.v. who makes caramel to add to beer, aerated waters, spirits, or vinegar, by heating sugar to specified temperature in a metal vessel until action and colour change to dark brown are completed; allows to cool, dissolves caramel in water, and concentrates solution in steam-jacketted. pans, regulating flow of steam by means of valve; runs out caramel into kegs or drums for export. revivifies animal charcoal, after use in sugar refining, by washing it in water to remove adhering sugar solution, and then burning it in a pipe kiln with external gas or coke furnace heat; feeds washed char to top of pipe by tipping or bucket conveyor; controls heating of pipe so that as char gradually tails it becomes re burnt, and opens door in bottom of pipe to allow reburnt char to fall into sheet iron cooling pipes provided with valves, which he opens at intervals to allow cooled reburnt char to fall out ready for re-use. shovels oxide (polysulphides of iron received from gas works) into mechanical screen whence it is mechanically conveyed to top of furnace, where sulphur and sulphides are burnt out of iron oxide; watches proper working of conveyor and furnace worm and automatic discharge; adjusts furnace dampers. a kiln man, q.v. who stokes coke fires in furnace which roasts iron pyrites; shovels pyrites into kiln; carefully regulates supply of air to kiln by keeping kiln door partially closed, so as to produce sulphur dioxide, used mainly in manufacture of sulphuric acid; when charge of pyrites contains no more sulphur, rakes out spent ore and recharges kiln by hand shovelling; cf. sulphur burner. shovels broken pieces of sulphur into hopper of sulphur burner, which is slowly revolving; adjusts screw feed by which sulphur is fed to end of burner; adjusts dampers to control air supply and egress of flames and acid fumes to Glover tower where pure sulphuric acid is condensed and concentrated. shovels bones into retorts and feeds furnace fires which heat retorts and so drive off volatile compounds (bone oil, etc. ), leaving bone ash; at end of calcination rakes out ash (or animal charcoal) and re-charges retorts. is in charge of chemical plant in which camphor is synthesised from pinene or other chemical compound, runs liquid pinene into vessel, opens valve admitting dry-chlorine gas to vessel, runs in fatty acids, controls stirring apparatus and valve of steam heating coil to form camphor. feeds an electric furnace, by hand, with a mixture of carbon and freshly burned lime; taps off carbide at intervals and casts into hard grey blocks in moulds. assists carbolic acid stillman (142) q.v. in separation or distillation of carbolic acid (phenol); controls steam valves, washes out stills, runs in acids, etc., under direction of stillman. a process man q.v. in charge of plant for making phenol (carbolic acid) from liquor remaining after extraction of naphthalene from coal tar middle oils; runs in caustic soda solution and mixes it with liquor; runs off layer of sodium phenate solution, neutralises with sulphuric acid or carbon dioxide gas, and runs off phenol which forms a separate layer. a process man q.v. who shovels a powdered mixture of exact proportions of chalk and ammonium sulphate into a pan, which he heats by means of a furnace; fumes evolved pass over into cooling chamber and condense on sides and roof as ammonium carbonate; scrapes deposit off chamber and shovels into casks or hags. see bicarbonate of soda maker. (iii) ammonia soda process, carbonates concentrated solution of ammonia in brine in carbonating tower by allowing solution to flow down tower against current of lime kiln gases, passage of which he controls by a valve; withdraws sludge of sodium bicarbonate crystals from bottom of tower, by opening valve and allowing it to flow out. adjusts valve to regulate trickle of weak potassium carbonate solution from tanks at top down coke filled cylinders in tower, up which furnace or lime kiln gases, containing carbon dioxide, are passing; takes sample of solution at foot of cylinder for test as to content of carbon dioxide and adjusts valves accordingly; from time to time pumps solution of carbon dioxide, which runs off from bottom of cylinders, into boilers where it is heated and the gas thereby set free, passes gas to gas holder or compressing pump. fills a series of iron pots with caustic liquor by means of power pump, and ladles out finished caustic after evaporation into drums; sometimes also feeds and attends to fires which heat pots. feeds and attends fires for evaporating caustic and assists caustic finisher q.v. stirs up, by band or mechanically, product from incinerator, cf. incinerator man, with water, and shovels in powdered lime to convert sodium carbonate into caustic soda; boils and stirs liquor by opening valve admitting steam to bottom of vessel, and, when action is complete, allows sludge to settle runs off caustic liquor and agitates sludge with fresh water to extract last traces of caustic. a process worker q.v. who makes lunar caustic (nitrate of silver) by dissolving silver in nitric acid, evaporating to dryness in hot water or steam jacketted pan, controlling hot water or steam-by means of valve and then heating to fusion point; for surgical purposes, fuses product with potassium nitrate and casts it in thin cylindrical sticks. as for caustic soda maker. a process worker q.v. who introduces powdered slaked lime into sodium carbonate solution (usually purified tank liquor is used, i.e., liquor obtained by dissolving black ash in water, cf. black ash maker); stirs mixture by mechanical means, or by opening valve and bubbling live steam through it; allows precipitate to settle, and runs off caustic liquor. assists caustic soda maker q.v. by opening valves, starting-up stirrer, etc., under his direction. operates a pump which drives weak caustic liquor, made by caustic soda maker q.v. into pans heated by waste heat from black ash furnaces, or from other sources, and rakes out sodium carbonate or other salts deposited on concentration; continues concentration till specific gravity of liquor is about 1.4, then runs liquid out for further concentration in caustic pots; cf. caustic finisher. puts measured quantities of several chemicals into vessels and mixes them mechanically. controls flow of steam by moans of valve and allows current of sulphur dioxide nitric fumes and air to pass into first of a series of leaden chambers in manufacture of sulphuric acid; sends samples of chamber acid (or acid drips formed by reaction of these gases in chambers) to laboratory periodically for analysis, watches progress of action through glazed apertures and operates pumps which drive gases from last chamber to Gay Lussac tower in which residual nitrogen oxides are extracted; supervises firing of pyrites burners q.v. see retort hand, animal charcoal. in charge of processes and plant for making of gun cotton; gives instructions as to charging, nitrating, washing or beating, etc., to various workers, including kier boiler, hand mixer, nitrator, washer, heater (148). a process worker q.v. who passes chlorine into cylinders of milk of lime, by opening valve, and moves lover which controls stirring apparatus inside cylinders; continues to pass chlorine till analysis shows that all milk of lime has been converted into calcium chloride or chlorate; runs liquor into settling tanks, and stirs in powdered potassium chloride; allows precipitate to settle and runs off solution into concentrating pans; controls by valve admission of steam to steam jacket and rakes out crystals of potassium chlorate formed. a process man q.v. engaged on plant in which chlorate of potash is made; assists chlorate of potash maker q.v. by shovelling lime into cylinder, running in water and stirring mixture mechanically to make milk of lime; or does any other part of process to help chlorate of potash maker q.v. generally. as for chlorate of potash maker. a process worker q.v. who concentrates calcium chloride, usually a by-product, by heating in steam-jacketted pans, controlling steam by means of a valve and, after cooling, runs liquor into drums. drives powerful gas pump by operating valve or switch, and so pumps pure chlorine gas, made electrolytically, through concentrated sulphuric acid into a cooled condensing coil, whence it flows in liquid form into strong steel vessel; controls valve regulating flow of water in outer jacket of condenser; draws off liquid chlorine, thus produced into cylinders as required. makes chrome yellow pigments by precipitating lead bichromate from a solution of potassium bichromate by running into it a solution of lead nitrate or acetate and stirring mixture to ensure thorough mixing; allows precipitate to settle, runs off liquor; runs in water and stirs up with precipitate to ensure thorough washing, runs out wash water and shovels out chrome on to porcelain plate to dry in hot air stove. a process worker q.v. engaged in converting coal tar products into dyes. (ii) in charge of muffle furnace in which ground oxide is reheated in process of further refinement. a process worker q.v. who runs hydrochloric acid into tanks into which he shovels broken iron pyrites (ore); sulphuretted hydrogen thus generated passes through tubs of solution containing cobalt and other compound thus precipitating iron and copper as sulphides; allows precipitate to settle, runs off solution which contains cobalt and nickel compounds, and stirs precipitate with water to extract last traces of cobalt and nickel salts. (paints) a process worker q.v. who makes colours for painting, etc., by mixing under suitable conditions fixed quantities of various chemicals; may weigh out quantities of chemicals, add water to dissolve them, mix and stir up solution so made, filter off precipitate formed, place filter and precipitate on shelf or drying oven to dry and scrape off precipitate formed; (dye) a process worker q.v. who, under the guidance of chemist is in charge of process of making dyes, by treating various chemical liquors, solutions or powders, taking great care that instructions as to quantities, method of production, temperatures of action, duration of action, etc., are rigidly observed. acid tower man, Glover tower man, sulphuric acid tower man, tower man; controls, by means of valve on pump or compressed air blower, supply and distribution of circulating acid in towers at inlet and outlet of series of sulphuric acid chambers. opens valve admitting steam to jacket of concentrating pan in which he has previously run acid to be concentrated; in this way drives off excess of water from weak acids: controls temperature of pans to avoid overheating and consequent decomposition; sometimes specifically designated, e.g., nitric acid concentrator, sulphuric acid concentrator. controls valve which starts up or stops gas exhausters (pumps) which draw vapours of oil and ammonia from oil still through condensers and thence to scrubbing towers, where gas is washed before it is returned to retorts for heating purposes; attends pump which pumps water through outer jacket of condenser to condense vapours coming from oil still, runs off, at intervals, oil condensed in condenser tanks into storage tanks. superintends working of condenser attached to a distillation plant; controls circulation and temperature of water, or other cooling medium, in condensing tank by running in water as required, and maintains clear passage through condenser by regulating speed of passage of condensing water, by means of valve, so that temperature does not fall low enough to cause distillation products to solidify; runs off condensed liquid into tanks or carboys, and sees that condenser plant is cleaned out after suitable intervals. a hydrochloric acid maker q.v. in an alkali works; controls, by means of valve, flow of water down towers in which hydrochloric acid gas is absorbed. in tin-plate manufacture, attends to vats in which he boils spent acid from pickling process with scrap iron; runs liquor off into vats and allows it to cool and deposit crystals of copperas on metal strips; runs off cooled liquor and detaches crystals from strips and sides of vat. a process worker q.v. in charge of plant, comprising lixiviating and precipitation vats, in which he stirs up by mechanical means roasted copper ores and so dissolves them in water, and deposits copper from solution by shovelling in iron turnings; washes deposited copper free from impurities; attends to filling and discharging of vats with copper compounds and liquors. a process worker q.v. in charge of plant in which copper sulphate is made as a by-product in other chemical processes, or direct from copper ores or copper turnings and crystallised to render it pure. as for carbolic acid process worker. (ii) (artificial silk) see acetate of sodium maker. boils up, in vats, certain vegetable substances yielding coloured liquors; concentrates and filters off liquor which is called cudbear; obsolescent . a process man q.v. who makes chlorine gas by acidising hydrochloric acid gas which he passes with air over red hot firebricks impregnated with cupric chloride or other suitable agent; regulates supplies of gas and air Jby means of valves; fills chamber in which action takes place with impregnated firebricks by shovelling, and burns producer gas beneath it to keep it heated, opens vents for supply of secondary air to producer gas burners. opens valve which either admits a stream of sulphuretted hydrogen through a tower, down which sulphuric acid is allowed to run, or operates pump which blows air through the sulphuric acid, after adding salt or hydrochloric acid, to remove arsenic; allows arsenic sulphide to settle and runs off de-arsenicated acid from tanks. see pan man (alum cake). (iii) dissolves any solid or liquid chemical in a liquid in process of making a further chemical product, e.g. , for crystallisation, precipitation or lixiviation; usually works at dissolving or mixing tanks; opens and closes valves, tips or shovels in or admits from hopper solid chemicals, controls mechanical stirrers. puts cellulose acetate into steam-heated drying stoves; empties stoves after drying. makes dynamite by pouring a measured quantity of nitroglycerine into a pan into which has been placed a weighed quantity of dry powdered kieselguhr; stirs up by hand till all nitroglycerine has been absorbed by kieselguhr; rubs mixture through a metal sieve to obtain it in granulated form. general terms covering a process man q.v. engaged in making chlorine by electrolytic decomposition of salt solution, and assistants, e.g. , cell room man (148); runs in salt solution in continuous stream, and runs out sodium hydrate solution formed by opening valves; switches on current and takes samples periodically for test by chemist; opens valve allowing chlorine formed to pass to bleaching powder or to liquifying plant. a process worker q.v. in charge of plant in which epsom salts, crystalline magnesium sulphate, is made by action of sulphuric acid on mineral magnesite, and product crystallised; shovels powdered mineral into tank, runs in dilute sulphuric acid, and stirs mechanically to ensure thorough mixing; runs liquor into crystallising tanks, and turns on valve admitting steam to steam jacket thereof; runs out weak liquor and detaches crystals from sides of tank or from strips of metal hanging in it. (ii) runs spent lye from esparto bleaching vats into evaporating pans and controls heat, as above, which concentrates liquor to syrupy consistency; passes concentrated lye to incinerator man q.v. a process worker q.v. who shovels leather scraps, animal hooves, cuttings from skins, etc., potassium carbonate powder and iron turnings into large pan set on hearth of reverberatory furnace, stirs up mixture during heating up to fusion point, and runs out metal produced, boils it in pan with water to extract prussiate of potash, runs off liquor, and evaporates in steam-jacketted pan to form crystals; rakes out crystals. fills steam jacketted pan by hand with crude or partially refined paraffin wax, paraffin scale; shovels in powdered charcoal and fuller's earth, melts wax by opening valve admitting steam to steam jacket, and stirs mixture by operating mechanical stirrer; allows bulk of charcoal and fuller's earth to settle and runs off wax to filter press; operates lever applying pressure to press forcing out molten wax and retaining last traces of charcoal, etc. ; runs off residual oil, called heavy oil or soft paraffin, which separates out from wax in separate layer, to refrigerating plant or to hydraulic press. (ii) shovels or tips soda crystals, obtained by crystal using liquor from black ash lixiviation tanks, into pan and feeds furnace which heats pan and drives off water of crystallisation from soda crystals; rakes over soda crystals and when anhydrous, shovels white ash into sacks ready for despatch. shovels or tips powdered mixture of bauxite and calcined soda ash on to hearth of reverberatory furnace; feeds fires of furnace and regulates them by adjusting dampers to give just bright red heat and avoid fusing mixture; rakes out mass with long handled iron rake into iron bogeys: pushes bogeys to grinding mill ready for lixiviation of sodium aluminate formed. shovels into furnace chrome ores to convert them into bi-chromates; feeds and attends fire heating furnace; withdraws burnt ores with long handled rake. in charge of furnace which he heats by passing a powerful electric current through material to be treated. feeds with fuel by shovel or adjusts gas burners of furnace for heating naturally occurring pigments (native earths) and other materials to produce such paints as oehres, amber, sienna, etc. ; adjusts dampers to maintain correct temperature. charges litharge, i.e. , lead which has undergone a preliminary process of oxidation in a furnace, on to hearth of reverberatory furnace or drossing oven, and rakes it over thus continually exposing fresh surfaces and stimulating oxidation, until it becomes bright red in colour, i.e. , red lead; removes product from furnace by shovel and allows it to cool. wheels barrow loads of salt from salt shed to weighing machine and then to salt cake pot; shovels or tips known weight of salt into large shallow pan; opens valve to run in correct quantity of sulphuric acid, and mixes up both thoroughly with long handled iron paddle; tends and feeds furnace which heats pan and contents, allowing hydrochloric acid gas formed to pass from pan into plant in which it is condensed and collected; when gas no longer escapes, pushes charge from pan on to floor of adjacent muffle furnace with long handled iron pusher and raises temperature to complete action by suitably stoking furnace; keeps mass stirred and raked over floor whilst heated; rakes out salt cake when action is finished into iron tubs or barrows provided with lids, for removal to black ash furnaces or salt cake sheds. a process worker q.v. engaged in recovery of glycerine from spent lye, a by-product of soap manufacture, or from sweet water, a by-product of candle making, or in its refining, e.g. as crude glycerine maker, glycerine Stillman (142), or white glycerine maker q.v. a process man q.v. who attends to plant in which glycerine is prepared in an impure state, from soap lye, by allowing lye to stand, skimming off any residual soap which floats on surface; then runs lye into lead-lined vessel, runs in hydrochloric acid and aluminium sulphate solutions; opens valve to admit compressed air which stirs up mixed liquids thus precipitating fatty acids; filters off precipitate by pumping liquor to filter press, opens valves of filter press as required, runs filtrate from press into tank, runs in alkaline solution and concentrates by heating in steam-jacketted pan or in special evaporator. runs off residual oil from refrigerators in which mineral oils are cooled to freeze out wax; shovels crude wax into barrows and wheels to filterer (paraffin wax) q.v. puts dried cellulose acetate into mill for grinding and attends to grinding operation. feeds and operates a mill in which raw materials or constituent materials are ground, to ensure that an explosive thoroughly uniform in composition is made; cf. incorporator (148). feeds, by hand, hopper of grinding mill with kieselguhr, absorbent infusorial earth, with which nitroglycerine is mixed in manufacture of dynamite; starts and stops mill by lever; controls chute by which ground kieselguhr falls into barrows or containers; replaces full containers by empty ones. spreads ground kieselguhr on floor of kiln by hand, and attends to fire below which heats and dries powder ready for use in manufacture of dynamite; rakes out dried kieselguhr into tubs or barrows for removal. controls by a valve flow of water down towers filled with coke up which hydrochloric gas, made as by-product in salt cake manufacture, cf. salt cake furnaceman, is led; takes samples of liquid, acid falling to tanks at bottom of towers for chemist; adjusts flow of water accordingly; runs off or pumps acid away to storage tanks. a process man q.v. who shovels scrap zinc into vessel containing sodium bisulphite solution; moves lever causing mechanical stirrer to assist action of zinc, runs in milk of lime to precipitate zinc, allows precipitate to settle and runs off solution, shovels in salt and stirs well to precipitate sodium hyposulphite, runs off solution, adds water to dissolve precipitate, concentrates solution by admitting steam to jacket of vessel, and rakes out crystals as formed; dissolves up crystals again in water and. runs in excess of caustic soda solution thus, on stirring, precipitating sodium hydrosulphite as a fine powder; runs off liquor and stirs powder up with alcohol to remove all traces of solution; runs off alcohol and allows to dry, ready for packing; shovelling often done by chemical labourer (149) q.v. controls valve of pumping apparatus which blows chlorine vapour under pressure into tanks containing caustic soda solution; takes samples of chlorite produced for tests by chemist; shuts off chlorine and opens valve to run liquid into storage tanks ready for filling of carboys. pan man (paper), roaster man, soda roaster man; receives concentrated spent lye from storage tanks or from evaporating plant, cf. evaporator man, runs it into shallow pans heated by means of a furnace which he tends; heats it to dryness and continues heating until all organic impurities have been burnt off, leaving sodium carbonate as main residue; rakes out residue into tanks ready for next process of lixiviation. opens valve to run sulphuric acid after de-arsenication, cf. de-arsenicator, into tanks into which he shovels or tips scrap iron, usually rusted to save oxidation at expense of acid; agitates acid by hand with iron stirrer to promote solution of iron; allows liquor to settle and runs off clear liquor when sufficiently strong into covered evaporating tanks; opens valve to admit steam to steam jacket and so concentrates solution, causing it to crystallise; runs off mother liquor and detaches crystals from sides of tank with iron scraper. concentrates sulphuric acid from Glover tower of plant; regulates valve to blow acid from weak acid tanks at foot of tower into concentration tanks heated by producer gas; opens valves admitting producer gas and air to combustion chamber; continues heating until acid is sufficiently concentrated; regulates, according to amount of acid fumes passing upwards, flow of water down tower into weak acid collecting tanks; when chemist's test reveals standard strength acid, runs out concentrated acid to storage tanks, or to tanks for filling carboys for despatch; regulates valve to pump refills of weak acid into concentration tanks. a concentrator q.v. who attends to kestner plant for evaporating liquids, mainly used for evaporating weak caustic soda ready for incinerator man q.v. acid burnerman, acid furnaceman, burner man, furnaceman, roaster man (chemicals); attends to kilns in which ores and other raw materials are heated to a high temperature, i.e., burnt, calcined, or roasted; charges, by shovelling, kiln or furnace with ore, tends and feeds fires, and by opening or dosing dampers, regulates supply of air to heated ores, and to furnace below. shovels a certain depth of ferric oxide upon claus kiln grate and pumps a mixture of sulphuretted hydrogen and air into cylindrical space below grate; heats oxide, by means of small fire below, in order to start kiln; mixed gases pass up through heated ferric oxide and form sulphur and steam by combustion, keeping oxide hot; sulphur vapour passes into series of cold chambers where it is deposited as liquid sulphur, or, as flowers of sulphur; runs off liquid sulphur at intervals, or scrapes flowers of sulphur from roof, sides and floor of chamber, and shovels it into sacks, bags or trucks. shovels powder composed of constituents of vitreous enamel into special crucibles, and places these by means of long-handled tongs into furnace which he tends; continues heating till contents of crucible are fused together, withdraws same from furnace, pours out fused mass into tank of water to cool and breaks it up ready for grinding to powder. shovels degreased hones. or refuse animal charcoal from sugar refineries, on to floor of kiln; feeds and attends fire below which beats charge, etc., and so converts it into bone ash; rakes out bone ash into barrows, to cool ready for grinding. melts scrap lead in iron pot and smelts load sulphate residues with coke in small furnace; also makes lead sulphide by stirring powdered sulphur into molten lead, and running lead sulphide into sticks, for use in de-arsenicating sulphuric acid. (ii) see furnaceman, red lead. a process worker q.v. in charge of plant in which poisonous gases are made, e.g. chlorine, cyanogen, phosphine, etc. wheels barrows of lime into lime house; tips lime into slaking bin and sprays with water, by hand; shovels slaked lime into belt conveyor, feeding grinding and screening machine, which in turn supplies bleaching powder maker q.v. with ground, sifted slaked lime; clears, by hand, at intervals, sieves of machine. a process worker q.v. who is responsible for preparation, strength, and running off, of liquors ready for crystallising vats or coolers; prepares liquors by stirring chemicals shovelled into tanks with water by hand or mechanically; varies strength of liquors by adding water or other solvent, or, by heating in pans by steam jacket, to which he admits steam by opening valve. shovels or places by hand pure metallic lead on to hearth of reverberatory furnace, where it is heated to dull redness, constantly rakes it over with long-handled metal rake to promote oxidation, until yellow or yellowish red substance in a fused state, known as litharge, is formed; rakes out litharge when oxidation is complete; wheels it in barrows to grinding and sifting machine; shovels it into machine hopper; at intervals, clears, by hand, machine sieves; cf. waster. an explosive worker (148) q.v. who shovels, with wooden shovel, picric acid crystals into steam jacketted tank; turns on -steam to melt crystals; liquid lyddite flows through grid in tank bottom to storage tank for shell filling; cf. picric acid worker. is engaged in production of partly or fully denatured alcohol; runs pure alcohol into tank and adds mineral naphtha or wood naphtha and colouring dye to it, carefully measuring volume added in order to conform with customs regulations; stirs mixed liquids by mechanical stirrer, and runs it out into storage tanks. accumulator manufacture, runs pure sulphuric acid into mixing tank, then runs in slowly, fixed volume of distilled water, stirring acid continuously by mechanical or hand stirrer during and after addition of water, to ensure uniformity of mixed acid for electrical accumulators; in chemical works , attends vats or tanks into which lie runs, pumps or blows, by compressed air, acids to be mixed; controls stirring apparatus to ensure thorough mixing, controls valves governing flow of brine in cooling coils when temperature changes, caused by mixing of acids, are not desirable. an explosive worker (148) q.v. who shovels ammonium nitrate into an Atlas mixing machine to be dried and ground to powder; starts and stops machine and empties contents into containers by hand lovers. mixes with the hands in leaden trough, gun cotton and nitroglycerine for making cordite, or mixes, by hand, materials for making other explosives. mixes ingredients of gunpowder by grinding weighed materials together in a pan mill. a process worker q.v. engaged in preparing pure chemical mordants, e.g. , bichromate of potash or soda, iron salts, stannous, chloride, or aluminium compounds. in charge of plant in which morphia (or morphine) is made from poppy-heads by boiling opium obtained therefrom with milk of lime, filtering off and concentrating filtrate, boiling it with ammonium chloride and allowing to stand till morphia separates out and can he filtered off. opening a valve, runs ammonia solution, or ammonia gas under pressure, into a tank, and similarly, runs in hydrochloric acid till ammonia is neutralised (revealed by chemist's test), admits steam to steam jacket to concentrate solution; shovels crystallised ammonium chloride from sides of a condensing tank and runs mother liquor back from tank for re-use. a process man q.v. engaged on any part of naphthalene plant of coal tar distillation works; extracts naphthalene by allowing part of coal tar distillate to cool in tanks; runs off liquor from impure naphthalene crystals deposited in tank, dries crystals in hydro extractor, and presses out residual, oils in powerful hydraulic press; may also purify naphthalene by heating it in shallow iron pan, by means of a steam coil, admitting steam by a valve, naphthalene passes off as a vapour and is condensed in large brick chamber; scrapes naphthalene from sides of chamber and shovels it into sacks. general term covering all persons employed in extracting and purifying naphthalene obtained from coal tar by distillation, and includes naphthalene man, naphthalene pressman (148), naphthalene refiner, naphthalene whizzerman (149) q.v. rectifies products of petroleum naphtha distillation by running them into vessel, running in sulphuric acid and stirring by hand or mechanically; allows liquids to stand and separate, runs off acid and impurities; runs in water and stirs again to remove traces of acid, allows to stand and separate again, and then runs off water with acid washings, repeats once again with fresh water, and runs naphtha away to store. (ii) artificial silk, see acetate of sodium maker. (ii) makes nitric acid by passing a mixture of ammonia and air along a tube containing a bar of platinum-coated with platinum black; opens valves and controls pump which pumps gases along tube; nitric acid fumes emerging from tube are passed up tower, down which nitric acid (liquid) is running, and in this way they are absorbed; controls flow of nitric acid down tower, by means of valve. a process worker q.v. who, by opening valve of compressed air blower, blows mixed nitric and sulphuric acids into a special nitrating vessel, cools it by passing cooled brine through cooling coils in vessel, then by opening valve, blows in finely divided spray of glycerine, and controls temperature by adjusting rate of flow of glycerine and use of cooling oil; allows nitroglycerine to separate out on top of acids, and blows in more waste acid at bottom of vessel, thus forcing out nitro-glycerine at fop. a process worker q.v. in charge of a plant in which nitrous oxide is made by heating pure ammonium nitrate in a gas-fired furnace; shovels ammonium nitrate on to floor of furnace; closes doors, lights gas jets heating furnace and watches temperature to ensure that it does not greatly exceed 180�C; washes gas by passing it through various chemical solutions to remove impurities, and collects pure gas in gas-holder or under pressure by means of pumping into storage cylinders. (ii) attends to octagon-shaped stills into which he runs hydrochloric acid, and shovels manganese dioxide to produce chlorine gas; runs out exhausted liquors which are then treated by neutraliser q.v. ; gas passes on to bleaching powder plant. attends to plant in which fuming sulphuric acid is made is made by passing a mixture of dry sulphur dioxide and oxygen through a tube containing finely divided platinum, i.e. , by contact process; controls flow of sulphur dioxide and oxygen by means of valves through vessels containing chemicals for purifying and drying them; connects electric current up to plates on which is finely divided platinum and, by switching on current, heats them whilst gases are passing to assist formation of sulphur trioxide; passes sulphur trioxide formed into strong sulphuric acid in which it dissolves forming oleum, or, fuming sulphuric acid. a process worker q.v. 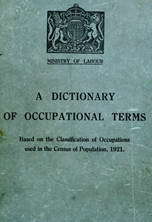 or a labourer who assists oleum man q.v. in making oleum, i.e. , fuming sulphuric acid. shovels load carbonate white lead) on to hearth of reverberatory furnace; tends furnace and charge during oxidation of latter, till it forms an oxide of lead of an orange colour; rakes out orange lead from hearth of furnace when process is complete. places certain lichens in tank of water and boils and then allows them to ferment to produce a pigment called orchil; precipitates colour with alum and filters, oxalic acid maker; places or shovels caustic soda into metal container and heats to required temperature; opens valve admitting carbon monoxide, so producing sodium formate; shovels this into a tank and admits a mineral acid; operates lever of mechanical stirrer, allows tank contents to settle and runs-off oxalic acid, product of the reaction, to crystallize. (ii) runs spent liquor, which has been neutralised, cf. neutraliser, from settling tank, in which impurities are precipitated, into tall oxidising cylinders, also runs in solution of milk of lime and opens valve admitting live steam and another admitting compressed air; when oxidation is completed runs out black "Weldon mud," from bottom of towers ready for re-use. see concentrating acid man ; sometimes specifically designated, e.g. , sulphuric acid pan man. a charge hand who looks after plant in which dry powdered clay is heated with concentrated sulphuric acid for making alum cake or sulphate of alumina; shovels powered clay into pan; runs in acid and sets automatic stirring gear in action, opens valve of steam coil to admit steam; runs out liquor into vat to cool and solidify. see rectified sulphuric acid man. recovers paraffin used in separating arsenic sulphide from acid, after de-arsenication of sulphuric acid; opening a valve, runs into a tank, waste paraffin liquor; admits liquid caustic to separate paraffin from waste acid; allows tank contents to settle, runs-off dirty acid and scoops paraffin from tank for re-use. shovels crude potassium carbonate on to hearth of calcining furnace and heats it by means of furnace which he feeds and tends; continues heating until a partly refined product called pearl ash ready for further purification is produced; rakes this from furnace hearth. (ii) if a solution of sodium chlorate is to be electrolysed, shovels potassium chloride into it and stirs, when sodium chloride is deposited as crystals leaving potassium perchlorate in solution; runs off solution and crystallises it in tanks heated by steam jacket. an explosive worker (148) q.v. engaged on production of picric acid crystals for lyddite; opening a valve, runs into a tank containing phenol-sulphonic mixture, a carefully measured volume of concentrated sulphuric acid; moves lever of a mechanical stirrer and opens tap to allow carefully measured volume of nitric acid to drip into tank; controls switch of a fan to draw-off nitrous fumes evolved to absorption towers for reconversion into nitric acid; when all nitric acid added, runs off liquor, leaving crystals in tank; cf. lyddite worker. (ii) mixes powdered orthoclase (potash felspar) with calcium chloride, lime and fluorspar (calcium fluoride) and heats powdered mixture to high temperature. a process worker q.v. employed on a plant in manufacture of potassium chlorate either by passing chlorine gas through hot milk of lime, adding solution of potassium chloride and crystallising out potassium chlorate formed, or by passing an electric current through hot dilute potassium chloride solution. charges shallow iron pans with salt and sulphuric acid, attends to firing, and supervises process until product is ready for salt cake furnace, when it passes to salt cake furnaceman q.v. ; gas evolved (hydrochloric acid gas) passes over and is absorbed in towers down which water is allowed to trickle. ; puts pig and scrap lead into pot and tends and feeds fire beneath it which melts lead; continues to add lead till charge is from 3 to 5 tons; attends to mechanical stirring of contents to stimulate oxidation; controls fan which draws Off lead oxide which forms on surface of molten lead. attends to stirring machine for precipitating cellulose acetate. see filterer (paraffin wax) ; cf. pressman (159). is in charge of part of plant in which nickel is extracted from its ores by chemical means; controls process of heating nickel matte in stream of carbon monoxide to form nickel carbonyl vapour, and deposition of nickel from this vapour at a higher temperature in decomposer towers; by means of valves, regulates admission of carbon-dioxide to towers, and of air to producer gas which is burnt in the towers to heat up nickel. general terms denoting anyone engaged on and in charge of a chemical process or a series of chemical processes, e.g. , refining, purifying, distilling, dissolving, crystallising, mixing, calcining or furnacing under supervision of foreman or works chemist; actual work involved may consist of one or more of the following operations; weighs out or measures quantities of chemicals to be used, runs liquors into or out of vats, towers, tanks, etc., at beginning or end of action, opens valves admitting steam or hot water to heating coils or cooled brine to cooling coils, charges, by shovelling, tipping or by means of hopper, raw materials on to hearth of furnace, and tends fires of furnace to heat such charges; controls electrical apparatus for production of chemical by electrolytic action in bath of liquid, and extracting samples of liquid for analysis at intervals to ascertain progress of reaction; shovels metal scrap into tank of liquor for purpose of depositing another metal; stirs up mixtures of liquids, or of liquid with solid usually in form of powder, to promote or stimulate action; stirs by hand, taking care to use stirrer which will not affect liquids being stirred, or operates mechanical stirrer; evaporates liquors in shallow pans by heating them with furnace gases, or by means of hot water or steam coils; extracts crystals formed on concentration by raking them out or by withdrawing strips of lead (on which crystals have been deposited) which have been suspended in liquors whilst cooling after evaporation; purifies liquors by running into them other liquors, stirring up by hand or mechanically, allowing two liquids to settle out and drawing off purer liquid separately or allows impurity or precipitate to settle out and draws off purer liquor; extracts chemicals from mixture of chemicals in solution, by adding a further solution to precipitate chemical required, and then pouring whole on to small muslin frame to filter off precipitate, or pumps it to filter press, and extracts precipitate in cakes from filter press bags; to purify gases, passes them up towers, down which is allowed to run a liquid which dissolves out impurities, or opens valve which allows them to pass through chambers spread with layer of chemical which extracts impurities, or may purify gases by causing them to bubble through liquids which extract impurities; sometimes carefully watches temperature of reaction, and regulates it by increasing or decreasing circulation of steam, hot water, or cooled brine through coil, by means of valves, or by turning on supply of gas to burners; is usually assisted by chemical workers and labourers (149) q.v. who may do most of work described above under process worker's supervision and instruction; process worker can usually do his work in absence of chemist, and would refer to latter only in case of need. a process worker q.v. who extracts impurities from chemicals by washing, chemical action, filtering, freezing, crystallising. distilling, etc. ; sometimes specifically designated, e.g. , acid purifier, sulphuric acid purifier. attends to plant for purifying mercury used in electrolytic chlorine production; regulates, by a valve, flow of steam into sodium mercury amalgam in a tank forming caustic soda, and liberating mercury, which he runs off from lighter caustic soda back to electrolytic cell. a process worker q.v. who prepares pyridine from bone oil; opening a valve, runs product of distillation of hones into tank and, similarly, adds measured quantity of sulphuric acid; then opens valve which passes stream of ammonia gas into liquors; continues process until pyridine forms a separate layer on surface of liquor; runs off liquor into another tank and collects layer of pyridine in drums placed beneath tank draining pipe. is in charge of tar plant in which he prepares pyridine by one of following methods; (a) opening a valve, runs acid tar from naphtha washer into tank, adds water and starts a mechanical stirrer, causing tar to come to surface; skims-off tar, with hand scoop and runs in alkali solution till acid is neutralised, allowing pyridine to form separate layer; skims this from liquid and places into another tank for distillation; runs-off remaining liquid; (b) runs clarified acid liquor into tank and opens valve passing ammonia through it; skims off separated pyridine as above. a concentrating acid man q.v. who concentrates rectified sulphuric acid. (iii) a purifier q.v. in charge of plant in which acids are purified and concentrated; sometimes specifically designated, e.g. sulphuric acid refiner. purifies that fraction of petroleum which distils over between 150�—300� C., by running it into tank, adding sulphuric acid and stirring up liquids by starling mechanical agitator; allows sulphuric acid to separate and then runs it off; repeats process with caustic soda solution, and finally with water; separates nil in each case by allowing it to form layer oil top of other liquid and running off either upper or lower layer. a process worker q.v. in charge of plant for refining naphthalene received from naphthalene pressman (148) q.v. ; places, drops, etc., cakes of naphthalene in steam-jacketted tank, opens valve admitting steam to jacket thus melting naphthalene, moves lever to start up mechanical stirrer and, opening valve, runs in small quantity of strong sulphuric acid, continues stirring to bring acid into close contact with naphthalene; allows liquor to settle and runs off acid (lower) layer, repeats process with water and then with a caustic solution; thou runs off naphthalene to vessels to solidify; may also purify it further either by subliming or by distilling the insoluble residue in steam. in charge of plant in which quinine sulphate, obtained from cinchona bark, is purified by recrystallisation; runs solution of quinine sulphate into steam-jacketted pans, opens valve admitting steam, and rakes out crystals as formed; re-dissolves crystals in water and repeats this operation until sufficiently pure quinine is formed. shovels crude saltpetre into steam-jacketted pan, runs in water and stirs it mechanically, at same time opens valve admitting steam to jacket or coil thus dissolving saltpetre; if any solid impurities are present, runs liquor through muslin frame filter into another steam-heated tank; continues heating liquor until crystals begin to form, rakes out crystals from sides and allows solution to cool depositing more crystals in doing so; shovels crystals into revolving pan of hydro-extractor to dry them. shovels crude sulphur or brimstone on to hearth of closed firebrick chamber and tends and feeds fire beneath this hearth, so that sulphur melts and finally vaporises; vapours pass into a cool brick chamber where they are deposited on sides, roof, and floor in a pure state; removes deposited sulphur at intervals, by scraping from walls and roof of chamber and shovelling off from floor into sacks. see filterer (paraffin wax) ; cf. wax refiner (159). is in charge of sulphur refining plant, charges retort with brimstone and feeds furnace, runs off refined sulphur in viscous state and rakes out black or residual sulphur from retort; may also break up and grind refined and black sulphur; cf. brimstone grinder (149). makes animal charcoal by shovelling cleaned (degreased) bones into retort, closing door thereof, and heating retort by means of producer gas or by direct furnace firing until decomposition is complete; rakes out charred bones; vapours pass over into condenser and condense forming bone oil. a black ash maker q.v. who shovels mixed and broken salt cake, cf. salt cake furnaceman, limestone, and coal dust into large revolving furnace; closes door of cylinder, and attends to fire, hot gases from which pass axially through centre of revolving cylinder; moves lever causing cylinder to revolve thus ensuring oven heating of contents; continues process until flame of carbon monoxide are seen to pass from surface into chimney, when heating is stopped; then opens charging door of cylinder and rakes out fused mass (black ash) into iron trucks placed ready to receive it. see incinerator man (paper manufacture). (ii) see furnaceman, salt cake. contraction for sulphate of ammonia maker; see sulphate house man. an evaporator man q.v. who attends a Scott evaporator; opening a valve, runs or pumps into apparatus liquor to be evaporated; opens valve admitting steam which heats up liquor; runs concentrated liquor out of apparatus. a process worker q.v. who recovers precious metals from "mud" produced in making sulphate of copper by dissolving process, or produced from bottom of baths in electrolytic refining of copper, using heating or smelting process; cf. ore furnaceman (171). places powdered mixture of cobalt oxide, silica (pure sand) and potassium carbonate into a wheeled fireclay crucible, and wheels crucible to furnace; attends to heating of furnace by shovelling coal therein or by regulating gas valves; when powder is fused, withdraws crucible and, using iron rod, tips fused mass, into water to break it up ready for grinding again to powder which is a blue pigment known as smalt. shovels impure crystals of sodium carbonate on to hearth of furnace and feeds and attends fire which heats furnace and drives off all water of crystallisation from crystals leaving anhydrous sodium carbonate or soda ash; when action is complete, rakes out soda ash into metal tubs to cool; may purify ash by grinding up soda ash with small coal or sawdust and heating mass in furnace again; latter method obsolescent. general term for any man engaged in manufacture of alkali by ammonia-soda process; includes ammonia Stillman (142), bicarbonate of soda maker, soda ask maker q.v. assists soda crystal maker q.v. shovels soda ash, cf. soda ash maker, into tank, runs in water (or mother liquor from previous operation) and stirs mechanically to assist solution of chemical; allows solution to stand and settle, runs off clear solution into shallow pans heated by waste gases from black ash furnaces or by steam jacket or coil, and allows soda to crystallise out on cooling; rakes out crystals as formed. assists bi-carbonate of soda maker q.v. in shovelling soda ash, raking-out crystals, etc. general term for any man employed on a plant for recovering caustic soda from spent lye that has been used for bleaching esparto in paper manufacture, including incinerator man, causticiser man, and evaporator man q.v. runs (liquid) silk dope, composed mainly of cellulose acetate, into spinning machine and maintains flow of silk dope through jets. a process worker q.v. who makes sugar of lead (lead acetate) by spreading, with shovel, litharge (lead oxide) on shelves in copper containers, and opening valve which admits acetic acid vapour to vessels; continues until chemist's test reveals completion of process; shovels out lead acetate formed into tank, adds water and stirs mechanically; evaporates solution in steam jacketted vessel by opening steam valve, and rakes out, from a condensing tank, crystals formed from vapour. engaged on plant in which ammonia formed in gas and coal tar manufacture is converted into ammonium sulphate; may perform any of operations involved, e.g. runs or pumps ammoniac liquor into settling tanks to allow residual coal tar to settle out; runs out purer liquor through heated coil, and thence into still down which it passes slowly against steam which heats it and drives off part of ammonia; opens valves controlling entry of steam to bottom of still, and of milk of lime solution at middle of still, thus mixing them with ammoniacal liquor and driving off rest of ammonia and other gases (impurities); spreads iron oxide on grids of purifiers and removes it when spent; ammonium sulphate formed in absorption tank falls to bottom as crystals which are taken out by hand scoop or blown out by steam or air pressure, shovelled into hydro-extractor, dried, and scooped into bags. (ii) is in charge of evaporating and crystallising plant in which sulphate of ammonia liquor is treated; opens valves (to run sulphate or ammonia and other liquids respectively into a tank; opens steam valve to pass steam through liquor or through tank jacket; stirs, with hand rod, allows liquor to crystallise, runs off mother liquor for re-use and shovels-out crystals; dries crystals in centrifugal hydro-extractors. opening valves, runs into sulphonating plant, i.e. big lead-lined tanks fitted with mechanical stirrers, fixed quantities of strong sulphuric acid and phenol (carbolic acid), stirring continuously to ensure thorough mixing and production of phenol sulphonic acid; opens valve to pump this away to nitrating plant, where picric acid is made, see picric acid worker. a process worker q.v. engaged on plant producing sulphuric acid by either chamber or contact process; may be doing work of pyrites burners, or sulphur burners q.v. , workers who shovel nitre and run sulphuric acid into nitre pots to form oxides of nitrogen, boiler attendants who' raise steam for making the acid or for driving machinery, chamber men q.v. , or acid pump men who pump acid formed into tanks at tops of Gay Lussac or Glover towers, or away to storage tanks. runs molten wax, containing oil, into trays to cool; places trays on shelves of oven, and opens valve to turn on steam in oven, causing oil to exude from wax leaving pure wax still solid on trays; allows oil to drain away and by further heating melts wax, and pumps it away to be further purified by treatment with charcoal and fuller's earth. shovels copper ore, after calcination, into tank, opens valve to run in weak solution of acid and operates mechanical stirring apparatus, thus dissolving and freeing ore from lighter and more soluble impurities; runs out liquor and shovels out purer ore ready for extraction of rest of copper by wet process. a process worker q.v. in charge of plant for extracting tannin from bark; feeds strips of tannin bark to bark cutting machine, which cuts bark into chips; shovels chips on to false bottom of tank and runs in water; opens valve passing steam through coil below false bottom, thus heating water and extracting last traces of tannin; runs out liquor into tank and adds blood or albumen to bleach it, runs it into evaporating tank heated by opening steam valve admitting steam to jacket, and evaporates liquor usually under reduced pressure by opening valve connecting tank with gas pump; after evaporation, runs out tannin extract into containers for despatch. runs crude oil and sulphuric acid into iron vessels and opens valve admitting jet of compressed air to stir them; allows tarry matter and acid to settle out and runs off oil; runs in caustic soda solution, stirs up mixture by compressed air as above, and separates soda tar by drawing off pure oil; washes both acid- and soda-tars in water, separates them from washing liquor, and pumps tar off to storage tanks; liquor from acid tar washing is used for manufacture of sulphate of ammonia. (ii) dissolver man; opens valves to pump sulphuric acid up to tank at top of tower, to run it therefrom over copper ores in tower and. to pump air up tower against acid; acid on reaching bottom of tower runs into storage tank as sulphate of copper; tips fresh copper ore into tower from time to time; runs off sulphate of copper to crystallising plant. extracts nitric acid from waste acids after nitration, by opening valve which allows mixed sulphuric and nitric acids, i.e. , waste acid, to run out of tank at top and run down a tower which is heated at bottom, causing nitric acid to be driven off as nitric fumes, which are subsequently condensed; runs out sulphuric acid from bottom of tower into cooling vessels, and pumps them thence into storage tanks; regulates valves, levers, etc., when running acid down tower, and passing brine through cooling coils, etc. ; sometimes done by denitrator (142) q.v. see condenser man (hydrochloric acid). weighs out and mixes, by shovelling them into lever-operated grinding machine, dried china clay, sodium carbonate, charcoal and sulphur; shovels mixture on to hearth of closed muffle furnace, and tends to gas or fire which heats furnace, thus calcining mixture; rakes out calcined mixture and mixes in more sulphur, and calcines again; repeats this until product is of desired colour (ultramarine); grinds ultramarine, when sufficiently cool, for use. general term for men employed in viscous department, prior to spinning of artificial silk, including acetate of sodium maker, cellulose acetate precipitator. general term for any man engaged in mixing, fusing and quenching vitreous enamel, including dry grinder (vitreous enamel (148), kiln man (vitreous enamel) and kiln labourer (vitreous enamel) (149) q.v. attends plant for washing cellulose acetate, prior to spinning artificial silk. places in vat nitrated cotton (i.e. , guncotton) received from nitrator (guncotton) q.v. , opens valve to run in cold water, stirs up mechanically, admits steam until water boils, to remove acid up to 1 per cent., and runs off washing water; repeats this operation several times in order further to remove acids used in nitration process and to hydrolise unstable bodies in cotton; finally washes in cold water and leaves cotton in vat for beater (148) q.v. produces lead massicot (a powdery yellow oxide) by a process similar to that used by litharge maker q.v. ; furnace is slightly different and temperature of action lower. employed on any process in production of chlorine by Weldon process; may do any one or more of processes described below; shovels pyrolusite (natural manganese dioxide) or runs in Weldon mud, from previous working into still, runs in hydrochloric acid, and opens valve which passes steam into still to drive off chlorine; at end of reaction, runs out manganese liquors into tanks, in which he also runs milk of lime to neutralise acid, stirs mixture mechanically and pumps it to settling tank, runs off clear liquor and passes it, together with milk of lime solution, down oxidiser towers up which steam and compressed air are passed; blows air through liquors for some hours till manganese is oxidised, withdraws samples for analysis at intervals to note progress of oxidation; when complete runs out liquor and mud that has formed into settling tank; runs off clear liquid and runs mud into chlorine still for next process. as for black ash maker ; obsolescent. a process worker q.v. who makes a pure colourless glycerine by re-distilling glycerine and clarifying distillate by mixing it with powdered charcoal and filtering; shovels powdered charcoal, in measured quantities, in steam jacketted tank containing glycerine; turns on steam and starts mechanical stirrer to heat and mix tank contents; glycerine vapour passes to condensing tank; opens valve to start air pump, which blows glycerine to a filter. an evaporator man q.v. in charge of special type of evaporating plant called a Yaryan in the soda recovery process in paper manufacture, in glue making, etc.